Tomorrow is the official start of Disneyland’s 60th anniversary celebration, so we thought it would be a good time to take a Throwback Thursday look back at the feline presence in the park’s early days. 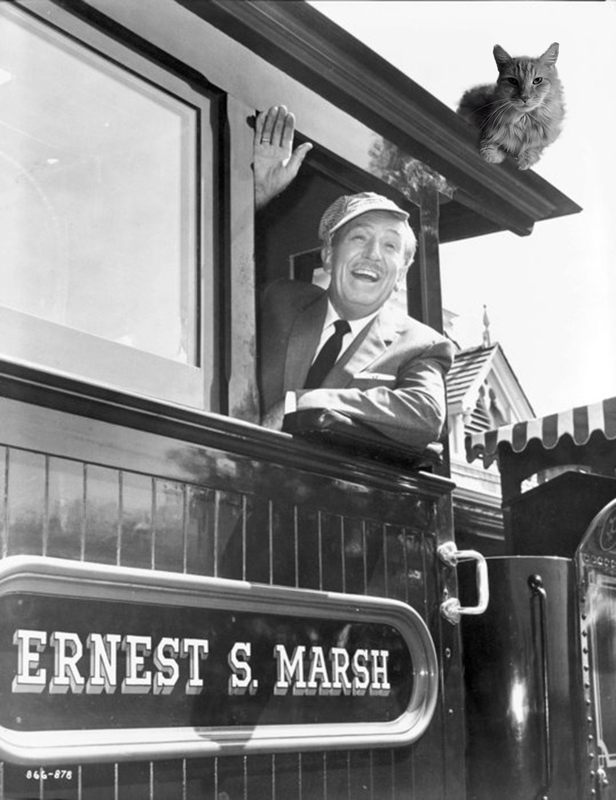 Here is a rarely-seen photo of Walt riding the Disneyland Railroad with a kitty stowaway. Just as most humans had no idea what to expect when Disneyland opened its gates in 1955, the cats also took a little while to adjust. Some lessons were learned more quickly than others (for instance, either to stay away from the hippo area of the Jungle Cruise entirely or to plan on wearing earplugs). Other things took a little longer to sink in. I’ll never forget the story of a curious kitty who kept breaking into the popcorn stands overnight to lick the leftover butter from the glass. He would always exhaust himself and end up falling asleep in the popcorn reservoir—and then he would be rudely awakened the next morning by yelling cast members. This series of events must have happened at least 15 times before he gave up butter entirely and started watching his cholesterol. Early guests also always looked much more dapper than they tend to today. Cats might have had fun trying to pee on the hem of a lady’s fancy dress or seeing how many pockets of a man’s suit they could leave hairballs in. I also heard of a cat who tried to set up a shoeshine stand in Frontierland, at which he would use his delightfully fishy saliva and his fluffy tail to give men’s patent leather shoes a spit-shine. Of course, Disneyland was much smaller in those days than it is now. There was no Toontown and no Critter Country. Even New Orleans Square wouldn’t be built for almost a decade. Instead, there was plenty of extra space for the cats to roam around without being interrupted by guests. Occasionally, they might even spot Walt Disney wandering around these undeveloped areas of land and rub up against his leg.